On a weekend when the talk in the club was of the Senior side, Carniny Amateurs progressing to the third round of the Irish Cup on Saturday, the youth teams also had a relatively pleasing weekend with only two losses from their ten games. It was a big derby week last weekend for the club with the Under 10s winning their derby match against neighbours Northend up in the NWCDYL but the real derbies were back in Ballymena in the National League. In the U14 clash with BUFC YA, a Bailie Young brace helped the Ballymena Reds to a 3-1 win. Whilst at U13, BUFC YA proved too strong for the Carniny boys. This was another weekend with a ‘hat trick’ of hat tricks with Adam Millar netting three against Northend at Under 10, U12’s Lewis Mearns also put three past Glendowan in their comfortable win, whilst Matthew Shevlin is in top form with a hat trick for the second game in a row for the Under 16s as they dispatched Sion Swifts. The Under 15s grabbed a late share of the points with Cookstown courtesy of a late equaliser. Up in the North West both the Under 9 teams won their respective matches, whilst the other Under 10 team kept up their 100 per cent record against Bertie Peacocks. The Under 11s lost out to a well drilled Maiden City side. Carniny Youth 8, Portrush 1: THe Reds were in free-scoring form against Portrush with goals from Leon Graham (2), Anthony Greer (2), Sam Mgee, Cameron Moody, Conlin Neill and an own goal. Carniny Amateurs 2, Institute 1: Adam Douglas found the net to put Carniny in front but Institute were level before the interval. The winning goal came in the second half when Lewis McKee’s effort hit the bar but striker Kenzie McMullan was on hand to turn the ball home to secure the Amateurs’ first win of the season. Carniny: McGreevey, McMullan, Douglas, Murray, McQuillan (capt), Strange, Wylie, McKee. Carniny Amateurs 5, Northend United 1: After Northend had cancelled out Joshua Balmer’s opener, Carniny regained the lead before half-time through Adam Millar. The same two players added to Carniny’s tally after the break before Millar rounded off the scoring by completing his hat-trick. Carniny: Farrenden, Murray, McClure, O’Boyle, Porter, Balmer, Millar, Robinson. Carniny Youth 4, Bertie Peacock Youths 1: After falling behind in the opening minute, Carniny recovered with goals from Diego Fletcher (2), Harry Foster and Ryan Clarke as the Reds continued their 100 per cent start. Carniny: Hanna, Kelly, Hanna, Fletcher, Foster, Condron, Clarke, Herron, Dael, McKendry. Carniny 1, Maiden City 4: Despite a good goal from Adger, Carniny were unable to make much headway against a good Maiden CIty outfit. Carniny: Friel, Dennison(c), McAuley, Reid, C Kerr, Pogue, Telford, Adger, R Kerr, Johnston, Gregg. Carniny kept their winning streak going in style with a 10-0 demolition of Glendowan. From the start Carniny pinned Glendowan in their own half. Lewis Mearns almost got Carniny off the mark with a low effort pushed past the post. His second effort was more clinical when he rounded the defender and fired the ball into the top corner to make it 1-0. Lee Lynn then blasted Carniny two up with one of his specials from 25 yards on the half volley. Lewis Mearns then got his second with a cool finish in the box to make it 3-0. The defence of Farquhar, Young, Lamont and Simpson were rarely troubled. Daniel McNicholl in goals had a quiet first half. Carniny’s fourth was a candidate for October’s goal of the month had the cameras been there. It was Craig Farquhar from 35 yards that gave the keeper no chance. Nicholas Moore chipped in from short range to make it five and soon after it was Moore again after being put through by Mearns who made it six with a well hit shot into the corner. Jake White rounded off a great first half with a super low finish to make it 7-0. Glendowan started the second half a lot better and put Carniny under a bit of pressure forcing some corners. Hamilton and Robinson were brought on to strengthen things in midfield and defence. Lamont was excellent all day and instrumental in Carniny’s clean sheet. Hunter after a poor first half came alive in the second half with some blinding dribbling skills that Glendowan just couldn’t handle. Aidan Graffin got a reward for his hard work with an excellent finish after being put through by Moore to make it eight. It was one of Hunter’s runs that got Carniny a penalty when he was brought down in the box. Lewis Mearns stepped up and put away the spot kick to get his hat trick. Scott Hunter then was in the action again when the ball fell to him just outside the box and he unleashed his right foot that saw his shot just dip under the bar to make it 10. Carniny are really starting to get into their stride with a trio of wins. They face stiffer opposition next week against Glentoran but are confident they can turn over one of the big two in the league. Carniny; McNicholl, Lamont, Young, Farquhar, Simpson, White, Anderson, Lynn, Hunter, Mearns, Graffin, Moore, Hamilton, Robinson. Carniny 0, Ballymena United YA 6: This was the first meeting of the 2 Ballymena sides and it is one Carniny will want to forget about. Two goals down at thehalf-time, Carniny conceded twice more in quick succession and Ballymena added to their tally in the closing stages. Carniny: Parker, Ervine, Close, Winter, Campbell, Kirk, Courtney, Archer, Gordon, O’Boyle, Stewart, J Logan, Clyde, Fleming, Warren. Carniny 3, Ballymena United YA 1: Carniny played Ballymena at the Showgrounds 3G in this eagerly awaited derby, for local bragging rights and it was Carniny who came out on top. The first half was a scrappy affair with Carniny taking the lead early on through Bailie Young who turned home after the keeper saved from Seaan Elliott. Ballymena drew level when a goal mouth scramble ended in Carniny putting the ball into their own net. Carniny were more composed in the second half and had the majority of play and this paid off when Ryan McGarry headed home from a corner. Carniny continued to control the game and extended their lead, when Bailie Young sealed the win with a fine strike from just outside the box. Carniny looked strong at the finish, taking all the points and the bragging rights until the next time they meet at least. Carniny: O’Brien, Lemon, Henderson, Houston, Young, McGarry, Marshall Stewart, Downey, McDonnell, Elliott, Leetch, Laverty, Foster, Reid, Laverty, Scullion. Carniny 1, Cookstown Youth 1: Carniny keeper James McClean did well to push a free kick over the bar before Cookstown took the lead from the penalty spot, given for handball, after 18 minutes. In the last minute however a point was salvaged when subs Jordan Hassan and Conor Doherty combined well before Doherty squared the ball into the path of Callum McGall who smashed the ball home from just inside the box. Carniny: McClean, Campbell, Evans, McComb, McGall, O’Mullan, Ferris, Houston ,Maybin, Keenan, McCloy, Adams, Hassan, Galbraith, Doherty. Carniny 6, Sion Swifts 1: Carniny opened the scoring when a fine through ball from Rowe allowed Shevlin to run through and finish well but Swifts levelled 10 minutes later. Carniny however finished the half stronger and regained the lead when Tyrone Balmer cut in form the right and hit an unstoppable shot from 25 yards into the roof of the net. 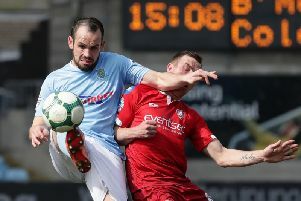 After a period when Sion Swifts were on top, Carniny increased their lead when Matthew Shevlin was played in again and finished past the advancing keeper. Soon after this Carniny scored again when Brandon Moore fired over the Sion Swifts goalkeeper. Carniny were now well on top and after McCann came on Matthew Shevlin completed his hat trick with a fine finish after being put through by Balmer. Carniny rounded off an excellent second half performance when Joshua Graham scored. Carniny: Marquess, Macartney, Rowe, Johnston, Wojtowicz, Killough, Moore, Flynn, Jaworski, Shevlin, Balmer, McCann, Ferguson, Graham.